BLOOMINGTON, Ind. -- Bill Grimes and Bill Colson have both had long, successful careers as writers. Both earned degrees from the Department of English in Indiana University's College of Arts and Sciences. On Wednesday (Nov. 3), they will be honored as distinguished alumni by the English department at an event on at 4 p.m. in the Georgian Room of the Indiana Memorial Union. 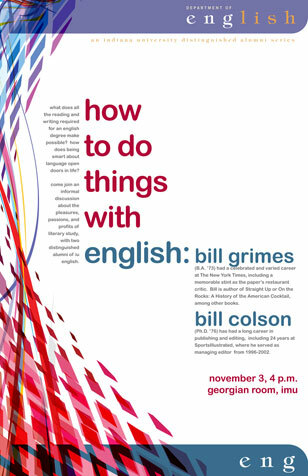 The event, "How to Do Things with English," is billed as an informal discussion about the pleasures, passions and profits of literary study. "We invite current students, faculty, staff and alumni to come and discuss questions such as 'what does all the reading and writing required for an English degree make possible?' and 'how does being smart about language open doors in life?'" said Jonathan Elmer, chair of the Department of English. "These are important issues that many of our students face. I expect that they will be both fascinated and encouraged to hear what these two alumni have accomplished with their degrees in English." Grimes, who earned his Bachelor of Arts degree in 1973, has had a celebrated and varied career at The New York Times, including a stint as the paper's restaurant critic and an even longer tenure as an obituary writer. He is the author of Straight Up or On the Rocks: A History of the American Cocktail, among other books. Colson, who earned his Ph.D. in 1976, has had a long career in publishing and editing, including 24 years at Sports Illustrated, where he served as managing editor from 1996 until 2002. Under his leadership, SI produced insightful and widely acclaimed sports journalism, including a detailed look at domestic violence by athletes, a cover story on the diminishing number of white athletes and an expose on Internet gambling. For more information about the Department of English, see http://www.indiana.edu/~engweb/index.shtml.